Forty years ago we were seeing the start of a boom in personal computing.. but at the other end of the scale we were also seeing the dawn of digital imaging, in this case with laser printers. 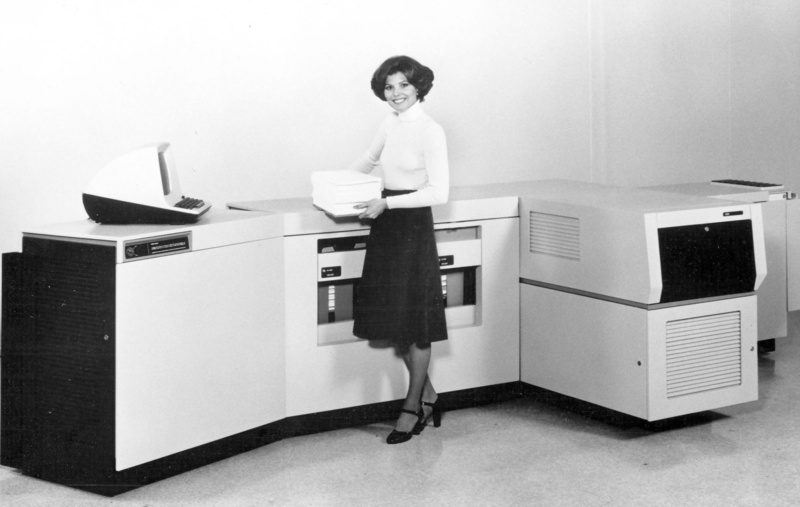 The Xerox 9700 was launched in 1977, and although it lagged behind the IBM 3800, the Xerox was much closer to today's office laser printers than the IBM which was basically a very fast line printer. Capable of a maximum throughput of 120 pages per minute on cut sheet paper at up to 300 dpi, the Xerox 9700 could combine text and graphics in ways that hadn't previously been possible. It was a big beast, which was understandable when you realise that it was basically three things joined together. Xerox took the guts of one of their own photocopiers and added a unit containing the laser and imaging system to it. Then they bolted a DEC PDP 11/34 to the whole thing to act as a controller. Sharp eyed readers may notice that in the picture the PDP 11 is being controlled by a Lear-Siegler ADM-3A. It was huge and hardly cheap. Even in 1980 after it had been around for a while, the Xerox 9700 still started at $35,240 (worth about $100,000 today). It took about another decade for laser printers to hit the mass market with devices such as the Apple LaserWriter or HP LaserJet range. Forty years later, Xerox still make printers including huge devices such as the Xerox Nuvera range which cost almost as much the 9700 did back in the day.